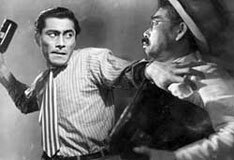 1948’s Drunken Angel marked the first time that Japanese director Akira Kurosawa directed masterful actor Toshiro Mifune, but the results are excellent enough that you can see why their collaborations continued for decades. 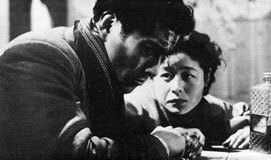 Even though Dr. Sanada (Takashi Shimura) is the film’s main character, it’s the slimy, impulsive Matsunaga (Mifune) that makes the most powerful impression. As Drunken Angel opens, Mifune’s young thug stumbles into the doctor’s office late one night with an injured hand that he claims he hurt by slamming it in a door. Of course, when the doctor pulls a bullet out of that hand, Matsunaga’s story changes a bit and a squabble erupts, but not before Dr. Sanada diagnoses him with a potentially terminal case of tuberculosis. Matsunaga is warned that if he doesn’t slow down his rambunctious lifestyle, he’ll surely die. The film examines the relationship between this altruistic, but self-indulgent, practitioner and his Yakuza patient and as a result ends up damning much of postwar Japanese culture. The first shot in Drunken Angel is a close-up of a grimy pond of water that sits in the middle of the section of Tokyo where the film takes place. Kurosawa uses this puddle to reflect the degradation of the society that surrounds it. The doctor warns the villagers to stay away from the water, since the town is plagued with typhus, but everyone seems content to carry on in their destructive behavior. What makes the doctor a compelling character is that he doesn’t exactly practice what he preaches. There are reasons that he lives in the slums, and they have as much to do with his desire to help the underserved populace as his own tendency to overindulge his vices. Still, instead of presenting him as an unsympathetic character Kurosawa contrasts him with his rather pompous and affluent colleague who talks about how silly pedestrians look while riding about in his chauffeured vehicle. To a degree, Kurosawa suggests a life spent trying to ignore large chunks of the populace is a lie. Perhaps, this is why he always pauses to observe them in his movies. Sanada’s flaws make him a more well-rounded character, and make the world that the film takes place in more convincing. Kurosawa seems to be telling us here that he was unable to find a spotless moral center among these people, and just about everything that appears pure in the film comes with its compromises (most of all Matsunaga’s attempts to set himself on the path to grace). 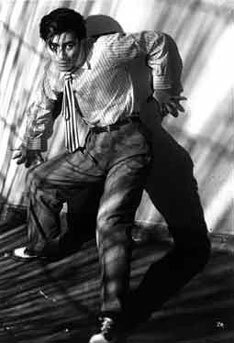 No matter how entertaining he makes drinking and dancing look, he always is sure to shows its excesses. There’s a stunning dance-hall number in the American-made “Social Center”, but even this location is presented as a 24-hour den of sin. Even the prettiest girl in this filth is likely to have a venereal disease and every moment of pensive beauty is in danger of succumbing to the muck that surrounds it. The most damning moments in Drunken Angel happen after a Yakuza ganglord returns to claim his turf after a three-year stint in prison. In the time he’s spent in jail, his world has changed completely, but he adapts quickly to those differences and soon begins making inroads toward his return to power. Down on his luck, Matsunaga quickly learns that the feudal pretenses of honor that the gangsters once had might not apply in this new capitalist culture (and forcing one to question if they were ever really there to begin with). The desire for self-preservation in the changing post-war era, where resources are scarce, creates a brutish strain of people. It’s no wonder that most of the decent people want to escape a city that’s so quick to abuse its own. The way that Kurosawa films the action when Matsunaga confronts his rival shows that he doesn’t sympathize much with either of them. They’re pathetic and their attempts to overtake each other can’t be endorsed with flashy filmmaking since the victor will only attempt to further repress and intimidate the few decent people that live in the area. The director puts two plaintive philosophies in his protagonist’s mouth at the end of the film that sum up many of his observable attitudes toward his characters. First, he says, “Once a beast, always a beast. You can never change anyone,” and then later decides, “A rational approach is the best approach for life.” Both of these clearly illustrate that Kurosawa is the farthest thing from a sentimentalist, no matter how much he tries to slap a happy ending on most of his films. Usually, to close on a positive note, he has to damn the vast majority of humanity, as he does here.